Bengal tigers purr. 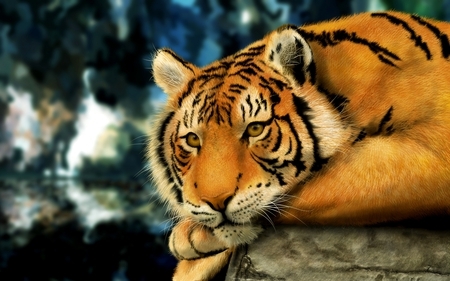 Domestic cats purr when breathing in as well as out - tigers purr only when breathing out. After killing its prey, the tiger always starts feeding from the hindquarters first. A tiger is a voracious eater. It can kill the equivalent of 30 buffaloes a year, and eat 65 pounds of meat in a night. The Siberian tiger, a cousin of the Bengal tiger, is the world's largest cat. ramyadevims Uploaded by ramyadevims on Jan 1, 2011 . THE ROYAL LOOK - Desktop Nexus Animals Download free wallpapers and background images: THE ROYAL LOOK. Desktop Nexus Animals background ID 550128. DID YOU KNOW? wonderful image and great facts!